Download "1.1 A team shall consist of seven players. A team can play with a minimum of 6 players." 2 sideswith all edges overlapped and any other hard substances covered with at least 2 inch of slow recovery rubber or similar material will be allowed. 2.7 Each player must wear a one piece belt, without any knots, at the waistline with three flags permanently attached. Flags must have a spring loaded clip. Teams must use flags provided by IM. 2.8 Teams must wear similar colored shirts or mesh jerseys provided by IM. Shirts must be tucked in the players pants or cut off a minimum of 4 inches above the top of the flag belt. 2.9 The official ball will be one supplied by IM. Teams may use a legal ball of their choice when in possession Time and score will be kept by the on-site score keeper Two discs will be used to mark the offensive and defensive scrimmage line. There will always be a 1 yard neutral zone on all plays. 3. Start of Game and Timing 3.1 Three minutes before the start of the game, the referee will conduct a captain's meeting in which he/she will designate which captain shall play rock, paper,scissors and the best 2 out of 3 tries wins(the OBU way ) The captain winning has the options for the first half or shall defer their option to the second half. The options for each half shall be: a.to choose whether his/her team will take the ball or defer. b. To choose the goal his/her team will defend. The captain, not having the first choice of options for a half, shall exercise the remaining option. 3.2 Games will consist of two halves of 22 minutes each with a 3 minute half-time. Timing will be continuous for the first half, and the first 20 minutes of the second half. Only team and official time-outs can stop the clock. The last two minutes before the end of the second half the referee shall stop the clock as in a regular game. 3 3.3 If a team is leading by 17 points or more in the final two minutes of the game, the mercy rule will be put into effect and the game will be over. 3.4 During the final two minutes of the game, the clock will stop for: a. Incomplete legal or illegal forward pass - starts on the snap. b. Out of bounds - starts on the snap. c. Safety - starts when the free kick is legally touched. d. Team time-out - starts on the snap. e. First downs - dependent on the previous play. f. Touchdowns - starts on the snap (after the try). 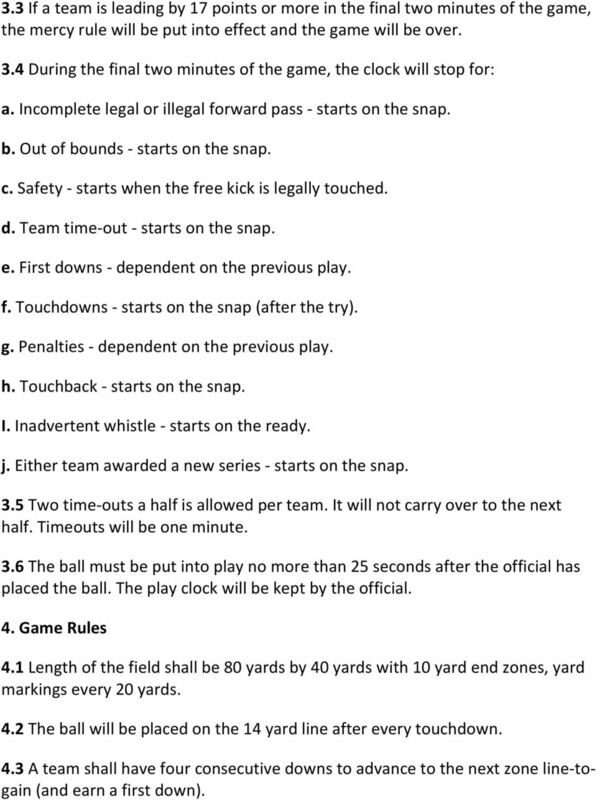 g. Penalties - dependent on the previous play. h. Touchback - starts on the snap. I. Inadvertent whistle - starts on the ready. j. Either team awarded a new series - starts on the snap. 3.5 Two time-outs a half is allowed per team. It will not carry over to the next half. Timeouts will be one minute. 3.6 The ball must be put into play no more than 25 seconds after the official has placed the ball. The play clock will be kept by the official. 4. Game Rules 4.1 Length of the field shall be 80 yards by 40 yards with 10 yard end zones, yard markings every 20 yards. 4.2 The ball will be placed on the 14 yard line after every touchdown. 4.3 A team shall have four consecutive downs to advance to the next zone line-togain (and earn a first down). 4 4.4 The zone line-to-gain in any series shall be the zone in advance of the ball, unless distance has been lost due to penalty or failure to gain. 4.5 A new series of downs will be awarded when a team moves the ball into the next zone on a play free from penalty. 5. Flag Belt Removal 5.1 When the flag belt is taken from the runner, the down shall end and the ball is declared dead. A player who removes the flag belt from the runner should immediately hold the flag belt above his/her head to assist the official in locating the spot where the capture occurred. A ball carrier is considered de-flagged when the clip of the flag belt becomes detached, not where the belt falls to the ground. 5.2 If a flag belt inadvertently falls off, a one hand tag between the shoulders and the knees constitutes a capture. 5.3 A player may leave his/her feet to remove a flag. 5.4 In an attempt to remove the flag belt from the ball carrier, defensive players may contact the body of an opponent with his/her hands. A defensive player may not hold, push or knock the ball carrier down in an attempt to remove the flag. 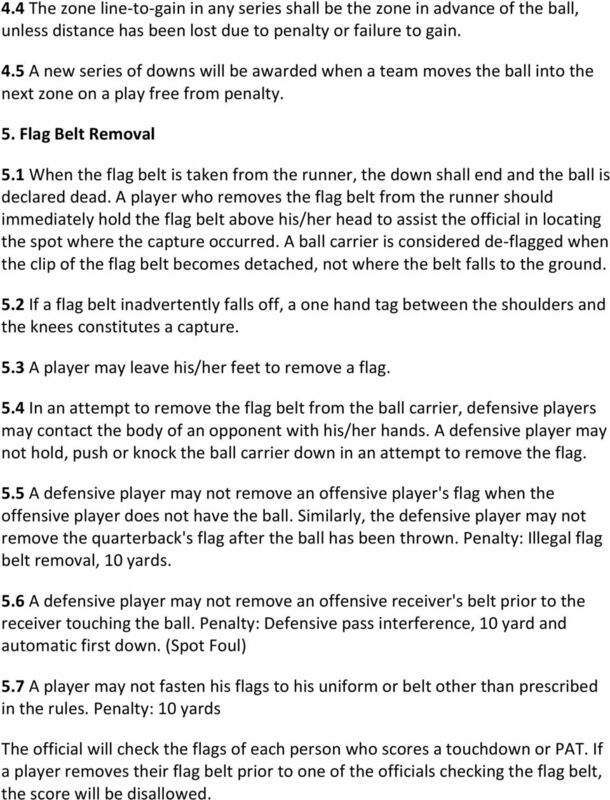 5.5 A defensive player may not remove an offensive player's flag when the offensive player does not have the ball. 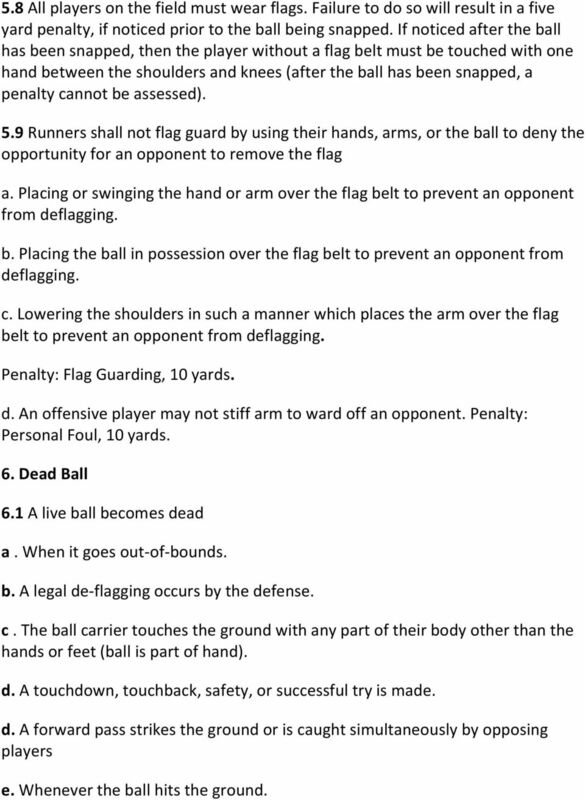 Similarly, the defensive player may not remove the quarterback's flag after the ball has been thrown. Penalty: Illegal flag belt removal, 10 yards. 5.6 A defensive player may not remove an offensive receiver's belt prior to the receiver touching the ball. Penalty: Defensive pass interference, 10 yard and automatic first down. (Spot Foul) 5.7 A player may not fasten his flags to his uniform or belt other than prescribed in the rules. 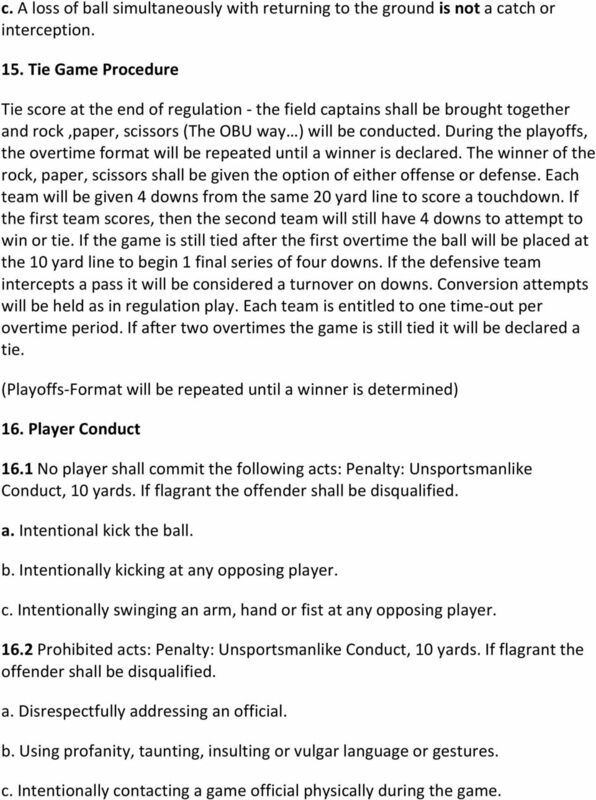 Penalty: 10 yards The official will check the flags of each person who scores a touchdown or PAT. 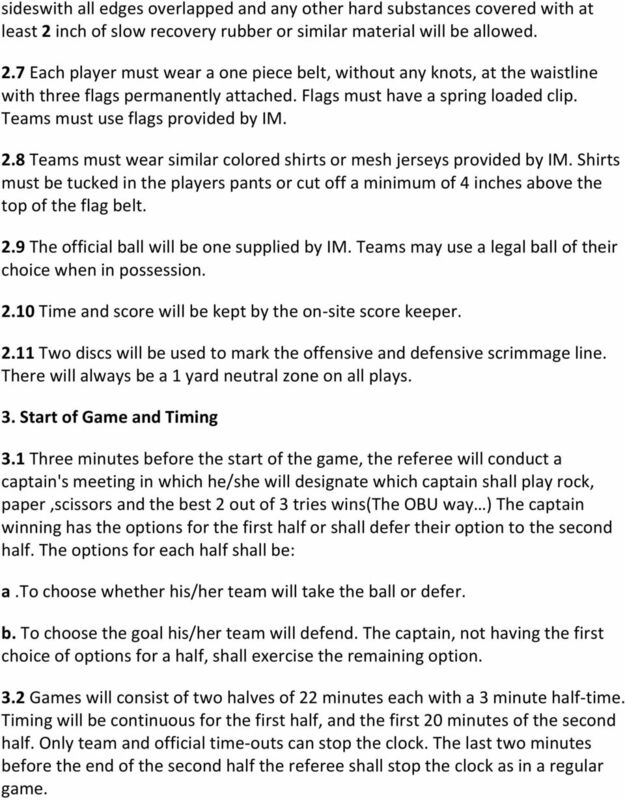 If a player removes their flag belt prior to one of the officials checking the flag belt, the score will be disallowed. 5 5.8 All players on the field must wear flags. Failure to do so will result in a five yard penalty, if noticed prior to the ball being snapped. If noticed after the ball has been snapped, then the player without a flag belt must be touched with one hand between the shoulders and knees (after the ball has been snapped, a penalty cannot be assessed). 5.9 Runners shall not flag guard by using their hands, arms, or the ball to deny the opportunity for an opponent to remove the flag a. Placing or swinging the hand or arm over the flag belt to prevent an opponent from deflagging. b. Placing the ball in possession over the flag belt to prevent an opponent from deflagging. c. Lowering the shoulders in such a manner which places the arm over the flag belt to prevent an opponent from deflagging. Penalty: Flag Guarding, 10 yards. d. An offensive player may not stiff arm to ward off an opponent. Penalty: Personal Foul, 10 yards. 6. Dead Ball 6.1 A live ball becomes dead a. When it goes out-of-bounds. b. A legal de-flagging occurs by the defense. c. The ball carrier touches the ground with any part of their body other than the hands or feet (ball is part of hand). d. A touchdown, touchback, safety, or successful try is made. d. A forward pass strikes the ground or is caught simultaneously by opposing players e. Whenever the ball hits the ground. 6 1. A fumble. 2. A snap from the center touches the ground (dead at the spot where it hits the ground). 3. When a muff of a punt strikes the ground. f. When an official sounds his/her whistle inadvertently during a down. 7. Position and Action During the Snap 7.1 The center, after assuming the position for the snap and adjusting the ball, may not move nor change the position of adjusting the ball, may not move nor change the position of the ball in a manner simulating the beginning of a play. The ball must be snapped in one continuous motion, not necessarily between the center's legs. The player receiving the snap must be 2 yards off the ball for a scrimmage play and for a punt. Penalty: Illegal procedure. 7.2 All offensive players must be momentarily within 15 yards of the ball. It must be clear who the seven offensive players are on each play. The intent of this rule is to eliminate all sleeper or hideout plays. Penalty: 10 yard penalty for illegal participation. 8. Motion/Shift 8.1 Only one offensive player may be in motion at the time of the snap. This motion must not be toward the opponents goal line. 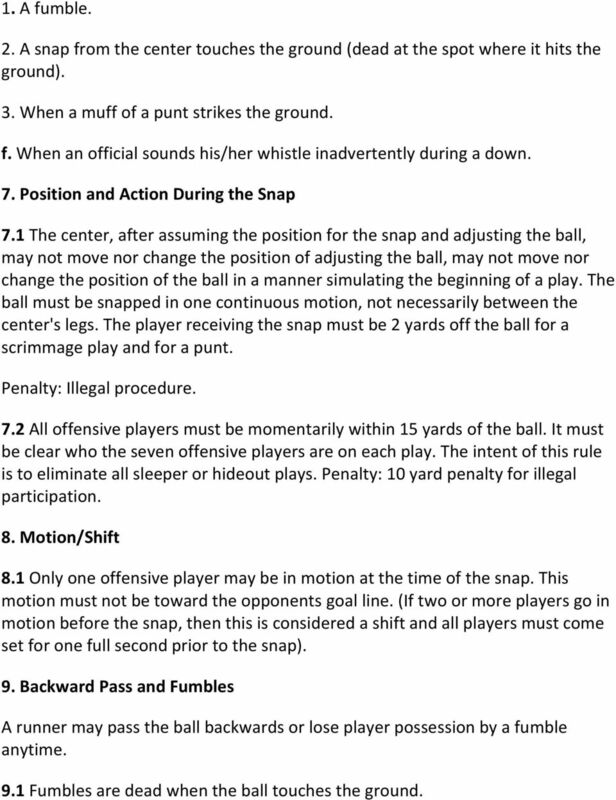 (If two or more players go in motion before the snap, then this is considered a shift and all players must come set for one full second prior to the snap). 9. Backward Pass and Fumbles A runner may pass the ball backwards or lose player possession by a fumble anytime. 9.1 Fumbles are dead when the ball touches the ground. 8 12. Putting the Ball in Play The ball will be put into play by a series of downs at the appropriate spot: a. After a touchdown--14 yard line. b. After a safety or touchback--14 yard line. c. Overtime--20 yard line. 13. 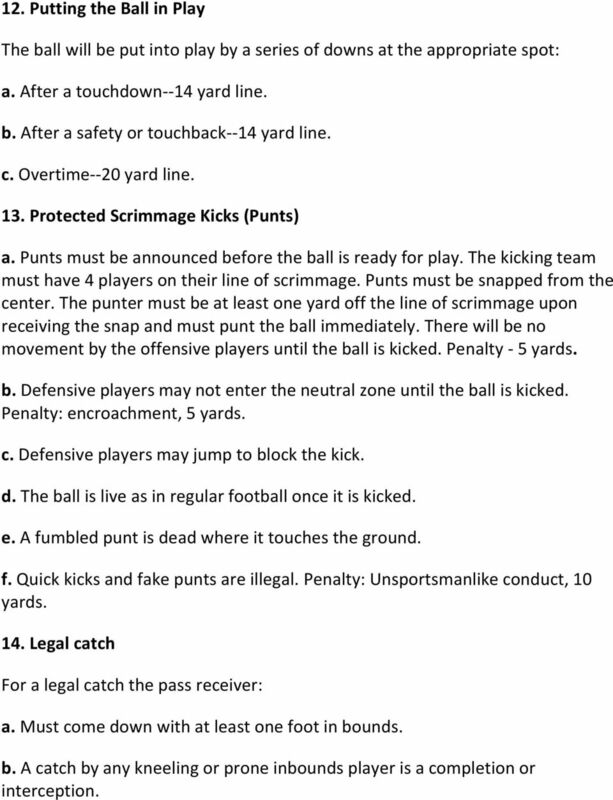 Protected Scrimmage Kicks (Punts) a. Punts must be announced before the ball is ready for play. The kicking team must have 4 players on their line of scrimmage. Punts must be snapped from the center. The punter must be at least one yard off the line of scrimmage upon receiving the snap and must punt the ball immediately. There will be no movement by the offensive players until the ball is kicked. Penalty - 5 yards. b. Defensive players may not enter the neutral zone until the ball is kicked. Penalty: encroachment, 5 yards. c. Defensive players may jump to block the kick. d. The ball is live as in regular football once it is kicked. e. A fumbled punt is dead where it touches the ground. f. Quick kicks and fake punts are illegal. Penalty: Unsportsmanlike conduct, 10 yards. 14. Legal catch For a legal catch the pass receiver: a. Must come down with at least one foot in bounds. b. A catch by any kneeling or prone inbounds player is a completion or interception. 9 c. A loss of ball simultaneously with returning to the ground is not a catch or interception. 15. Tie Game Procedure Tie score at the end of regulation - the field captains shall be brought together and rock,paper, scissors (The OBU way ) will be conducted. During the playoffs, the overtime format will be repeated until a winner is declared. The winner of the rock, paper, scissors shall be given the option of either offense or defense. Each team will be given 4 downs from the same 20 yard line to score a touchdown. If the first team scores, then the second team will still have 4 downs to attempt to win or tie. If the game is still tied after the first overtime the ball will be placed at the 10 yard line to begin 1 final series of four downs. If the defensive team intercepts a pass it will be considered a turnover on downs. Conversion attempts will be held as in regulation play. Each team is entitled to one time-out per overtime period. If after two overtimes the game is still tied it will be declared a tie. (Playoffs-Format will be repeated until a winner is determined) 16. 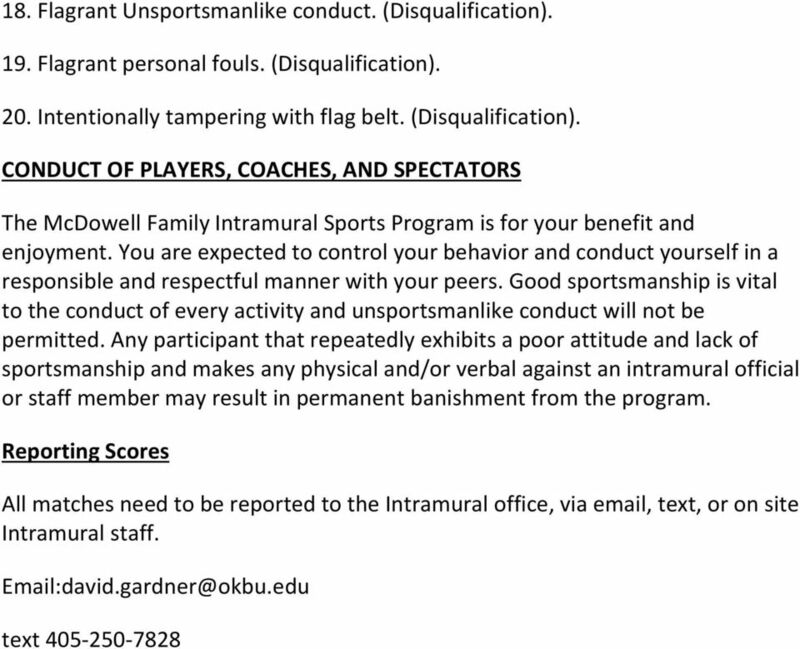 Player Conduct 16.1 No player shall commit the following acts: Penalty: Unsportsmanlike Conduct, 10 yards. If flagrant the offender shall be disqualified. a. Intentional kick the ball. b. Intentionally kicking at any opposing player. c. Intentionally swinging an arm, hand or fist at any opposing player Prohibited acts: Penalty: Unsportsmanlike Conduct, 10 yards. If flagrant the offender shall be disqualified. a. Disrespectfully addressing an official. b. Using profanity, taunting, insulting or vulgar language or gestures. c. Intentionally contacting a game official physically during the game. 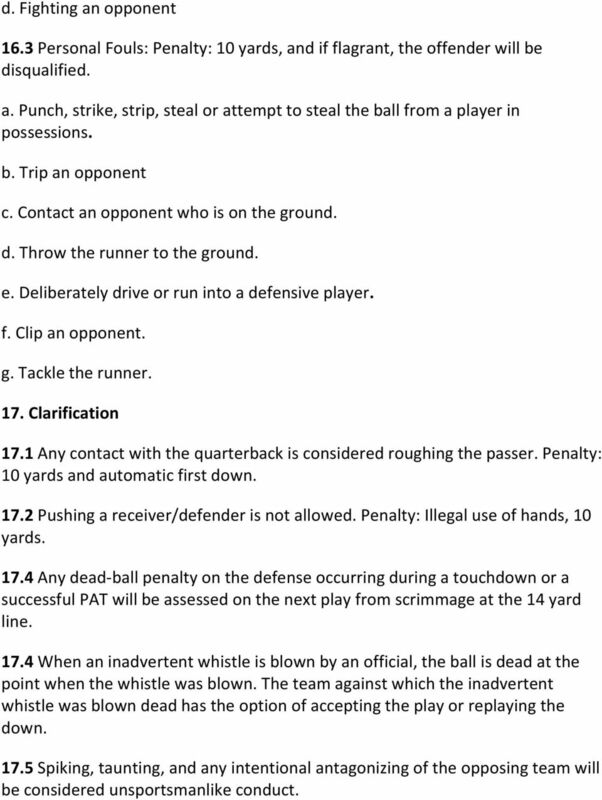 10 d. Fighting an opponent 16.3 Personal Fouls: Penalty: 10 yards, and if flagrant, the offender will be disqualified. a. Punch, strike, strip, steal or attempt to steal the ball from a player in possessions. b. Trip an opponent c. Contact an opponent who is on the ground. d. Throw the runner to the ground. e. Deliberately drive or run into a defensive player. f. Clip an opponent. g. Tackle the runner. 17. Clarification 17.1 Any contact with the quarterback is considered roughing the passer. 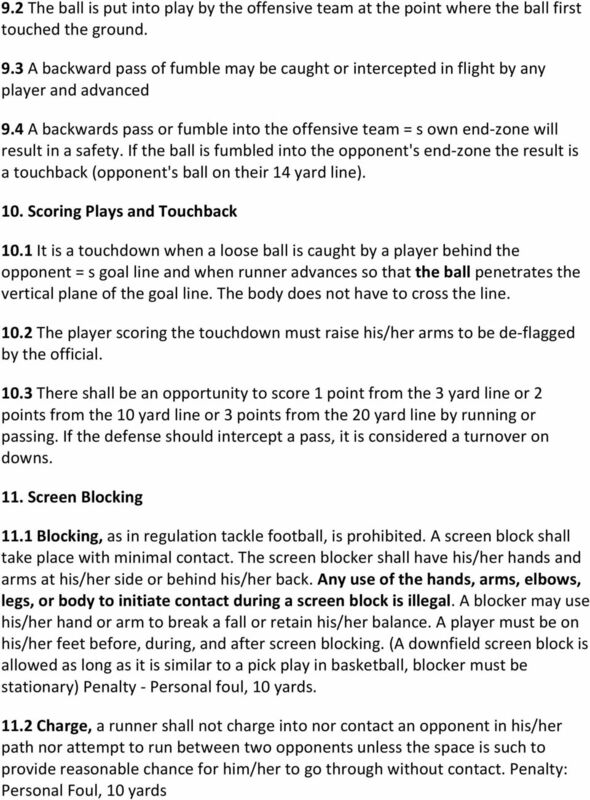 Penalty: 10 yards and automatic first down Pushing a receiver/defender is not allowed. 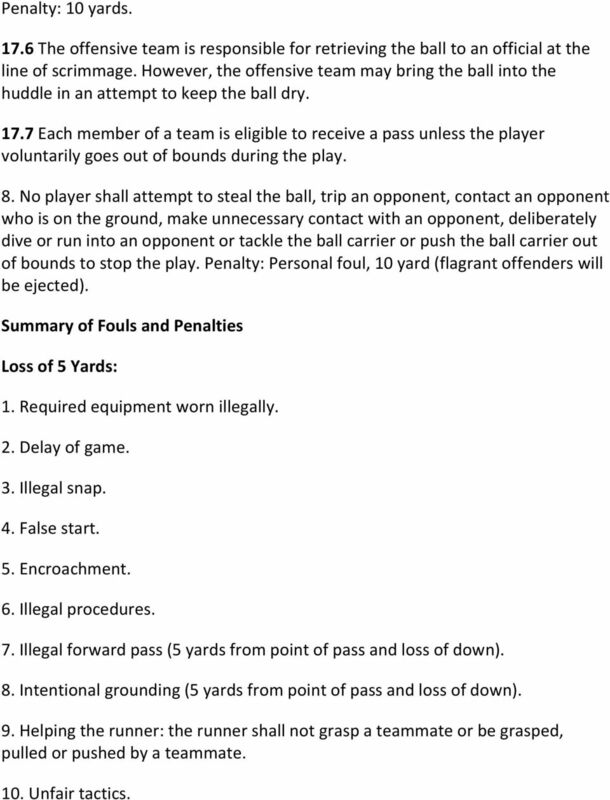 Penalty: Illegal use of hands, 10 yards Any dead-ball penalty on the defense occurring during a touchdown or a successful PAT will be assessed on the next play from scrimmage at the 14 yard line When an inadvertent whistle is blown by an official, the ball is dead at the point when the whistle was blown. The team against which the inadvertent whistle was blown dead has the option of accepting the play or replaying the down Spiking, taunting, and any intentional antagonizing of the opposing team will be considered unsportsmanlike conduct. 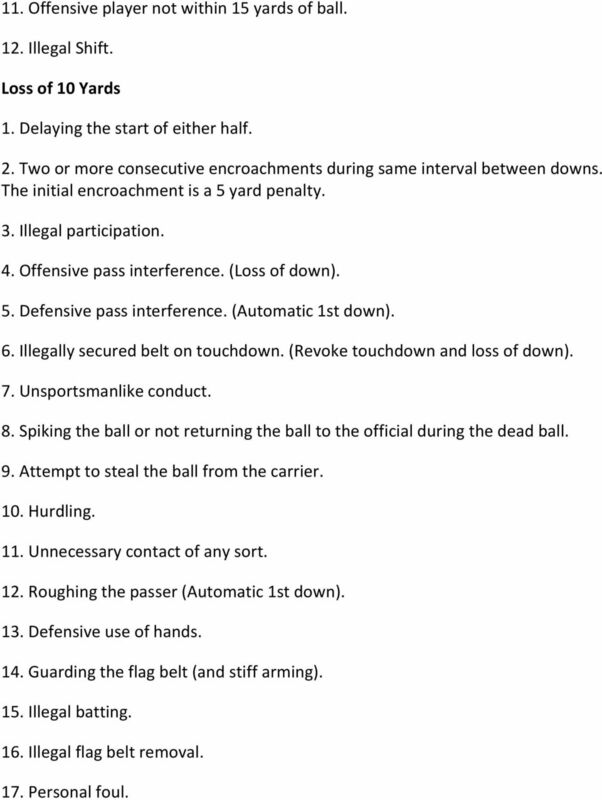 11 Penalty: 10 yards The offensive team is responsible for retrieving the ball to an official at the line of scrimmage. 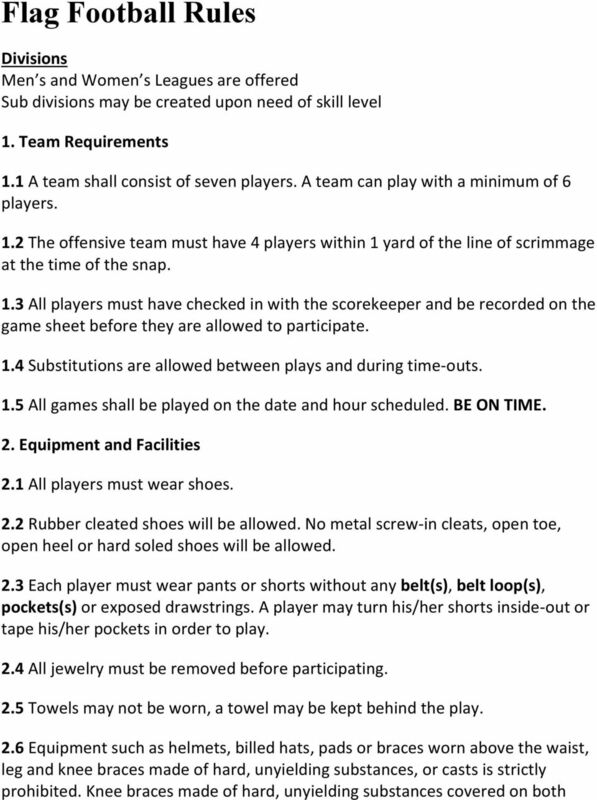 However, the offensive team may bring the ball into the huddle in an attempt to keep the ball dry Each member of a team is eligible to receive a pass unless the player voluntarily goes out of bounds during the play. 8. No player shall attempt to steal the ball, trip an opponent, contact an opponent who is on the ground, make unnecessary contact with an opponent, deliberately dive or run into an opponent or tackle the ball carrier or push the ball carrier out of bounds to stop the play. Penalty: Personal foul, 10 yard (flagrant offenders will be ejected). Summary of Fouls and Penalties Loss of 5 Yards: 1. Required equipment worn illegally. 2. Delay of game. 3. Illegal snap. 4. False start. 5. Encroachment. 6. Illegal procedures. 7. Illegal forward pass (5 yards from point of pass and loss of down). 8. Intentional grounding (5 yards from point of pass and loss of down). 9. Helping the runner: the runner shall not grasp a teammate or be grasped, pulled or pushed by a teammate. 10. Unfair tactics. 12 11. Offensive player not within 15 yards of ball. 12. Illegal Shift. Loss of 10 Yards 1. Delaying the start of either half. 2. Two or more consecutive encroachments during same interval between downs. The initial encroachment is a 5 yard penalty. 3. Illegal participation. 4. Offensive pass interference. (Loss of down). 5. Defensive pass interference. (Automatic 1st down). 6. Illegally secured belt on touchdown. (Revoke touchdown and loss of down). 7. Unsportsmanlike conduct. 8. Spiking the ball or not returning the ball to the official during the dead ball. 9. Attempt to steal the ball from the carrier. 10. Hurdling. 11. Unnecessary contact of any sort. 12. Roughing the passer (Automatic 1st down). 13. Defensive use of hands. 14. Guarding the flag belt (and stiff arming). 15. Illegal batting. 16. Illegal flag belt removal. 17. Personal foul.